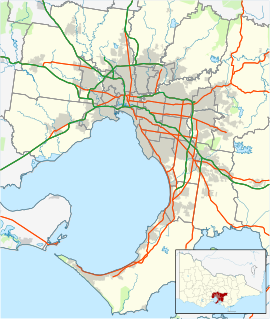 Chelsea Heights is a suburb in Melbourne, Victoria, Australia, 30 km south-east from Melbourne's central business district. Its local government area is the City of Kingston. At the 2016 census, Chelsea Heights had a population of approximately 5,335. On the border of Chelsea Heights and Chelsea is the Bayside Trail bicycle track, which begins in Seaford and continues north for approximately 43 km to Port Melbourne. Prior to the 1870s, Chelsea Heights was known as the Isles of Wannarkladdin, being the only high land of the Carrum Carrum Swamp. The aerial photography at the beginning of the Network 7 show Kath & Kim shows the central portion of Chelsea Heights. It is also the home of the famous "Bike Riding With King Browns". City of Springvale - the former local government area of which Chelsea Heights was a part. ^ a b "2016 Census QuickStats Chelsea Heights". Australian Bureau of Statistics. Retrieved 19 July 2018. Wikimedia Commons has media related to Chelsea Heights, Victoria. This page was last edited on 19 July 2018, at 08:44 (UTC).